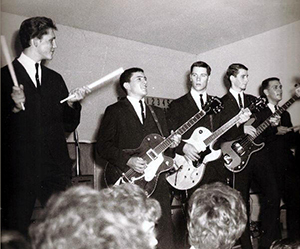 In the mid 1960s, local musicians like Michael Allsup grew up listening to Kent Whitt and the Downbeats, and would travel and join national bands like the multi-million selling Three D og Night. Michael recognized the influence of Kent Whitt and the Downbeats in his autobiography, “The Upside of Rock 'n’ Roll”. One of Michael’s first paying gigs was with the Chancellors at the Fable Room, where he earned $15. 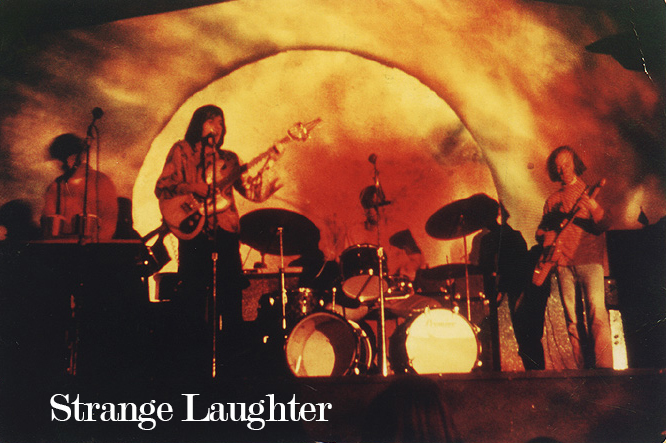 The Ratz were led by Gary Duncan (Grubb), who would later front the nationally acclaimed Quicksilver Messenger Service, recognized as one of the pioneering bands of the ‘60s. Jim Burgett put the Ratz on one of his shows with Chad & Jeremy in Reno. Pat Durr (later of Home Grown) joined the Ratz, taking over for Gary when he left for San Francisco. 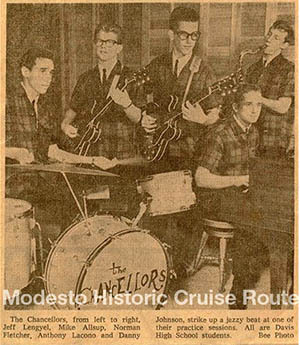 Modesto and the Stanislaus County area produced great live music through the 1940’s and ‘50’s, including early country acts like The Maddox Brothers and Sister Rose and R&B bands such as The Merced Blue Notes. By 1964, the British musical invasion spearheaded by the Beatles altered the musical landscape locally as well as nationally. 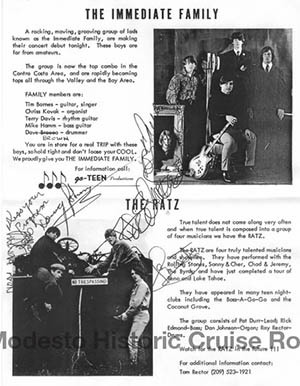 The Ratz were one of the premier Modesto area bands of the mid-1960’s, drawing big crowds by performing incendiary covers of songs by the Beatles, The Rolling Stones, and the Kinks, mixed with American rock and R&B standards. Distinctively attired in their trademark two-tone bell bottoms and velour shirts, The Ratz regularly whipped crowds into a frenzy with their trade-marked versions of “Under My Thumb”, “I Ain’t No Miracle Worker”, “G.L.O.R.I.A”, “Scene of the Crime”, and “I’m Alright”. 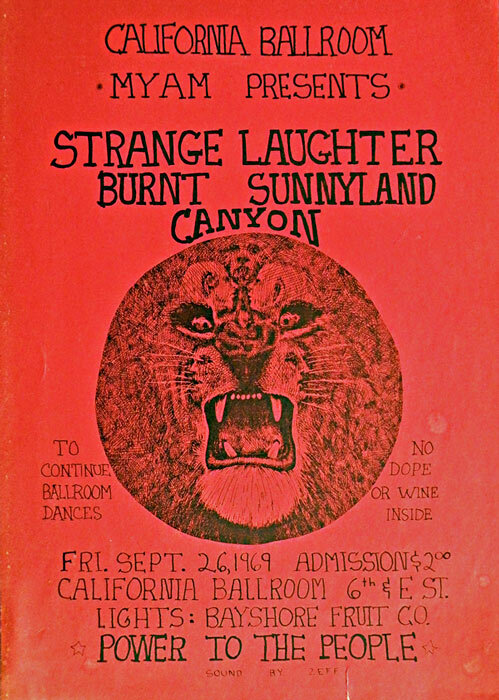 They played every venue in the Modesto area, notably the California Ballroom and the Purple Turnip, plus gigs in Monterey, Santa Cruz at the Cocoanut Grove, Lake Tahoe, and the Bay Area, including the Longshoreman’s Hall in San Francisco, home of Ken Kesey’s Acid Tests. 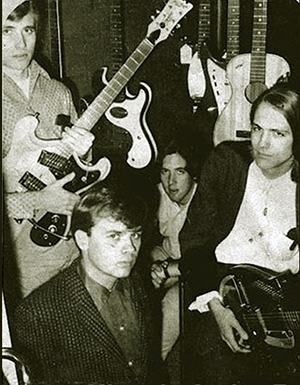 On one memorable occasion, The Ratz opened for Van Morrison and Them at the old Strand Theater on 10th Street. Though there were several changes in personnel early, the core of the band at the height of its popularity from 1965 through 1967 consisted of Ray Rector on drums, Daniel Johnson on keyboards and vocals, Patrick Durr on guitar and vocals, Rick Edmond on bass. Just as it takes many parts to make up the traditional, top of the barn type weathervane, so it takes many parts to make-up the group known as The Weathervane. 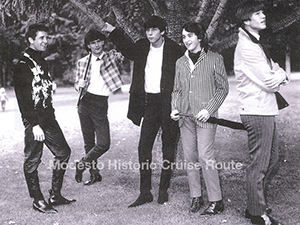 Five to be exact… Mike O'Bryan, Kevin Beamish, Eddie Bowman, Bob Wilson and Steffan Presley. The group was started just about a year and a half ago b Mike and Kevin with a $40 guitar, a beat up set of drums, a tape recorder and a dream. The dream has come a long way since then, and also has The Weathervane,as you will see tonight. The guys have played engagements in Monterey, the San Francisco Bay area and are familiar sight here in the Central Valley. Locally they have appeared at numerous school dances, at the Purple Turnip and have twice rocked the airwaves on the popular K-5 Dance-stand TV Show. The group is looking forward to a record release in the near future and… well, who knows? Aside fro the five physical parts of The Weathervane, there are other things that go toward comprising this outstanding group… things like a good helping of talent, ambition, showmanship, and just plain old love for performing. The Weathervane points the direction of the winds of change in today's go generation… your drive is their drive, your soul is their soul, today's sound is their sound… the ever-present sound of now. So tonight we invite you to experience and enjoy the sound of five guys on the way up… and loving every minute of it. After you've heard, we think you'll know why it's said… "Promise them anything, but give them the Weathervane." copy written by Jerry Long, 1967. 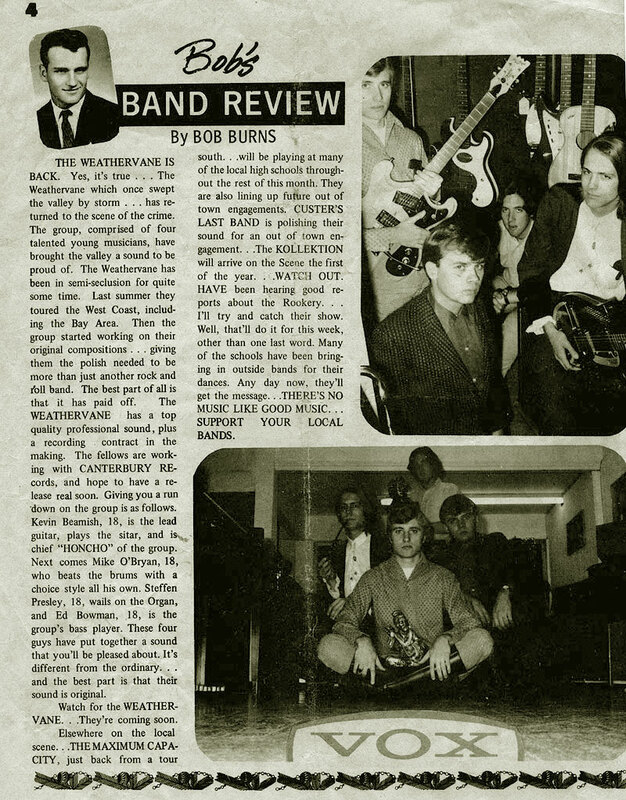 Doug Holroyd gained some notice with his band Fried Dirt and then later purchased Modesto Music from trumpeter Hank DeCoito. 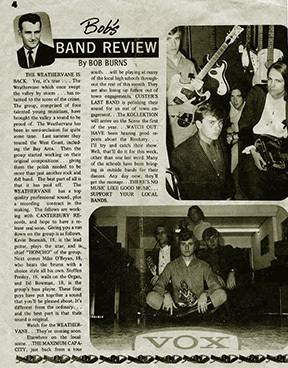 Other bands like the Weathervanes, The Eisage and the Nimitz Freeway would play up and down the Central Valley and were involved in the San Francisco music scene. Much celebrated history has been written about the San Francisco 60's music explosion and Summer of Love. 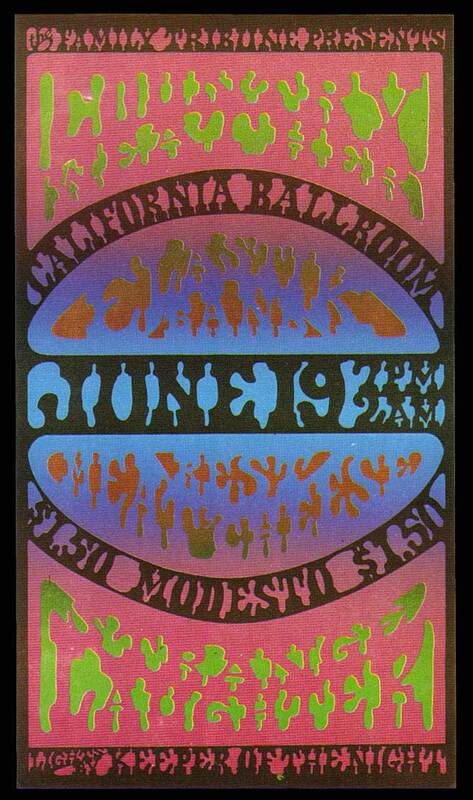 Flower Power, Haight / Ashbury, tune in, turn on and drop out, was all about re-inventing the world. But you may not know, the changing winds of time were never more present here in the valley as they were during the sixties. 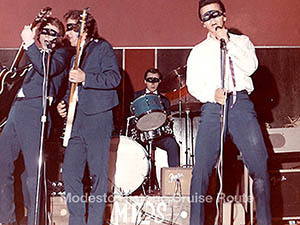 The California Ballroom dances of that era were Modesto's own local uprising in music and attitudes, as things were changing out on the west coast. Phychedelia was raging, and its popularity in Modesto was producing more musicians, guitar players, drummers, keyboardists, and garage bands than ever. Live rock concerts were flourishing like a fresh crop of valley produce. 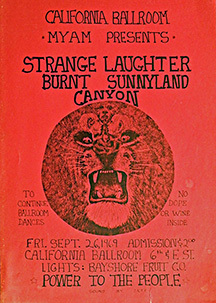 Electric bands with new naming conventions like Strange Laughter, Country Weather, Meat & Cheese, Sunnyland all came to perform at The Claifornia Ballroom, an unusual valley version of the Fillmore happening here in Modesto. Various promoters as the Family Tribune and MYAM produced shows here that went on for hours, opening doors at 5PM and going on until 2AM in the morning. A buck-fifty got you in! You could go downstairs to the basement kitchen and fill up on BBQ chicken, corn-on-the-cob and watermelon - do whatever, before heading upstairs to hit the ballroom floor with hundreds of local hipsters, hippies, bikers and cool kids, all jammed in and ready to rock. The scent of incense and petuli wafted everywhere. Pioneering light show artists as Keeper of the Night and Bayshore Fruit Co. , kept the oil and water gels, overheads, projectors and black lights in sync with everybody's good vibes. Local, legendary, sound engineer and inventor, Robert Zeff provided the first independent concert sound systems and the place just rocked with a tribal energy, driven by ultra-loud, powerful, mind numbing sounds. The Ballroom was our own, and Modesto hip had a center point. But as with all bright points of light, this hotspot would go up in flames. Although there were constant warnings against drug use on premisses and the under age drinking going on, our youth's indescretions would never be immune from the Modesto Police Department. Uniformed MPD officers would regularly walk through the dances, stop-and-frisk, make arrests, and generally let it be known these activities, and loud music, would not be tolerated. The tensions would boil over into a near mass riot one summer evening when the crowd, and crowd control, got out of hand. Police took positions surrounding the 6th Street area neighborhood hastily dispersing the masses, pulling the plug, and closing the ballroom doors. 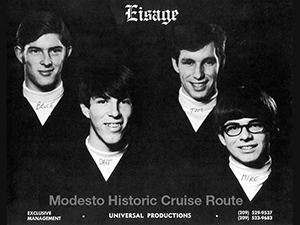 The Modesto music scene would not recover for sometime. Bright burning flames do snuff out. Sadly, over reaction, non-communication, and finally confrontation, put an end to these dances. Dance-concerts the likes of which will neve r be matched. 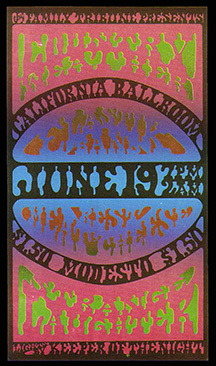 The California Ballroom hosted many legendary artists of the time, from Jimi Hendrix and Santana to Steve Miller, Elvin Bishop and Cold Blood, as well as the mulitudes of flower children who traveled to Modesto's "Peoples Dance Hall" to witness what was happening out here during the sixties. Best poster art ever! These two California Ballroom dances are prime examples of the psychedelic experience that typified that era in music and art. No one is certain who the creative artists were, but we would sure like to know. Click posters to enlage.